The Victory Parade in Moscow. 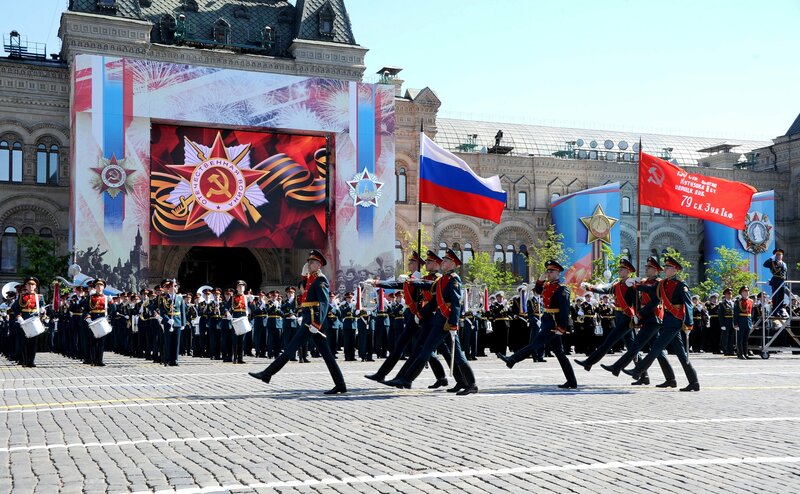 A military parade dedicated to the 71st anniversary of the victory in 1941–1945 Great Patriotic War took place on Moscow's Red Square on May 9. Russian Supreme Commander-in-Chief, President Vladimir Putin announced a minute of silence and made an address on the occasion of the 71st anniversary of the Victory in Great Patriotic War. Kazakh President Nursultan Nazarbayev and Russian Prime Minister Dmitry Medvedev also attended the parade. Russian Defense Minister Gen. of the Army Sergei Shoigu was inspecting the military parade. Ground Forces Commander-in-Chief Col. Gen. Oleg Salyukov is the parade commander, an Interfax-AVN correspondent has reported from the parade site. Traditionally, the parade was started by drummers from the Moscow Military Music School, whose students opened the legendary Victory Parade in 1945. A combined thousand-trumpet orchestra of the Moscow garrison played at the parade. Parade formations from all arms and branches of the Russian Armed Forces and law enforcement agency marched across the main square of the country. According to the Russian Defense Ministry, the parade involved over 10,000 servicemen and more than 100 pieces of modern armaments and military hardware, including Yars missile systems, Buk-M2 anti-aircraft missile complexes, Pantsir-S1 anti-aircraft missile and artillery complexes, T-90 tanks, BTR-82A armored personnel carriers, BMP-3 infantry combat vehicles and Msta-S self-propelled howitzers, in addition to prospective weapon systems - Armata tanks, Kurganets infantry combat vehicles, Bumerang armored personnel carriers and Koalitsiya self-propelled artillery complex. T-34, the main tank of the Soviet army in the period from 1942 till 1947, headed the armor column. For the first time, the parade featured Tigr modernized armored vehicles. A combined group of female servicemen from the Russian Defense Ministry's Military University and the Volsk High Rear Military School (branch) of the Gen. of the Army Khrulyov Military Academy marched across Red Square for the first time. Officers, sergeants and soldiers from military formations, Suvorov and Nakhimov military schools, military units, and cadets from education establishments of the Defense Ministry and other law enforcement agencies marched within parade formations. The airborne parade above Red Square was opened by a Mil Mi-26 military transport helicopter accompanied by four Mil Mi-8 helicopters and followed by groups of Mil Mi-28N, Kamov Ka-52 and Mil Mi-35 helicopters. Sukhoi Su-24, Su-25, Su-27 and Su-34, Mikoyan MiG-29 and MiG-31, Antonov An-124-100, Ilyushin Il-78, Tupolev Tu-22M3, Tu-95 and Tu-160 and Sukhoi Su-35S planes and Mil Mi-8, Mi-26, Mi-28N and Mi-35 and Kamov Ka-52 helicopters flew in a single air formation. The airborne parade above Red Square was about ten minutes long, with intervals of up to 20 seconds between groups of aircraft flying at an altitude of 150 to 400 meters. In all, 71 aircraft flew over Red Square, equal to the number of years which had passed since the end of WWII.